Good News!!!!! Jammu and Kashmir Public Service Commission has recently released the recruitment notification for this year. This time the Jammu and Kashmir Public Service Commission is going to fill overall 277 vacancies. The vacant posts available are Librarian and Physical Training Instructor. So, the candidates who are looking for Govt Jobs in India can apply for this JKPSC KAS Recruitment 2018 through Online before 2nd July 2018. For more details regarding JKPSC KAS Notification such as eligibility criteria, pay scale, application fee, etc. go through the whole page. 1.7 How To Apply For JKPSC KAS 2018? Ther vacancies for JKPSC KAS Recruitment is given in the above table. Candidates can go through and select the preferred post. Jammu and Kashmir Public Service Commission Circulated a notification for the KAS Gazetted Probationaries vacancies Jobs. Here total no of vacancies for the JKPSC KAS Recruitment is 277. So, applicants who are interested in JKPSC Government Jobs can apply for the JKPSC KAS Recruitment 2018. Candidates should get JKPSC KAS Old Papers for the preparation. without searching other sites, we provide JKPSC KAS Syllabus and JKPSC KAS Exam pattern 2018 on our page. Here we gave free download links for the JKPSC KAS Recruitment 2018. Educational Qualifications Graduation or its equivalent qualification from any recognized board from the recognized university. The candidates will be selected completely based on their performance in the written exam. 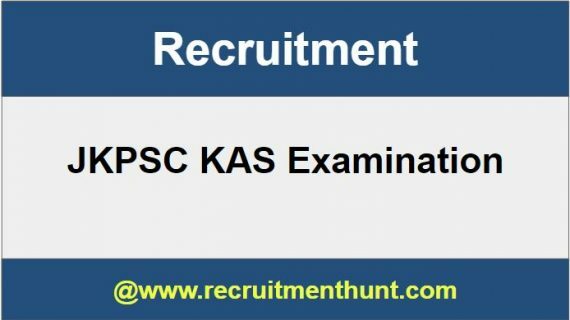 JKPSC KAS Recruitment is completely based on the merit of the candidates and their JKPSC KAS Eligibility. How To Apply For JKPSC KAS 2018? Open, the Notification of JKPSC KAS and read all the instructions carefully. Now click on the apply online link and fill all the necessary details. Upload your passport size photograph and signature also upload any other documents, if necessary. Finally, take a print out the payment challan and filled application for future reference. Candidates can know other Recruitment details by following our site Recruitment Hunt. Make all the material in use for your preparations. Also, recruitment Hunt provides content for Notifications, Admit Cards, Previous Year Question Papers, Competitive exams syllabus, Results and many more.